Forget that you are writing for trombones. Write a piece for Cello quartet, and then give it to trombones to perform. That paradoxal advice opened my mind and I explored new possibilities that I could otherwise not have imagined! In 1988, the piece was completed, and I was awarded a Special Distinction Diploma for it at the International Composers’ Competition in Budapest. 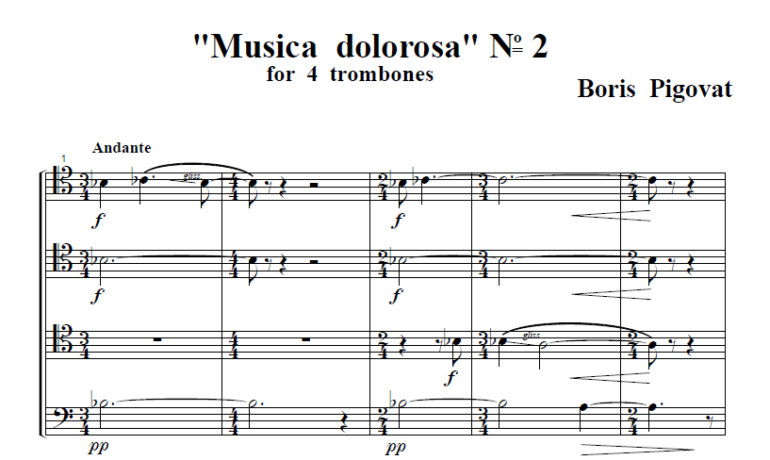 In 1989, the piece was premiered by the Hungarian F. List Music Academia Trombone Quartet, in Barch. Much later, the piece was published by the Israeli Music Center (IMC). Below is the recording from the premiere at Barch in 1989.